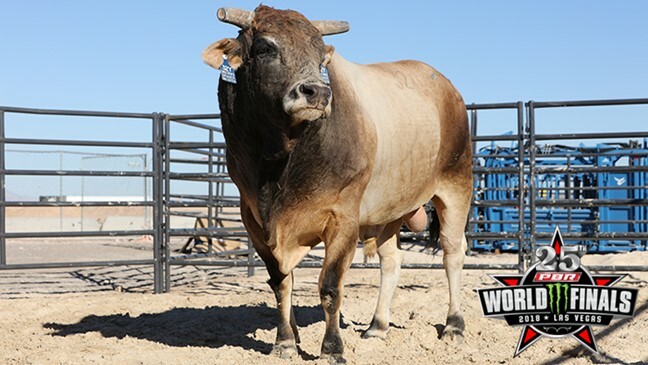 SweetPro’s Bruiser returns to competition for the first time in three months at the 2018 PBR World Finals. Photo: Andy Watson/BullStockMedia.com. LAS VEGAS – H.D. Page can only say for certain one thing about reigning and two-time World Champion bull SweetPro’s Bruiser. Bruiser did not compete at all during the second half of the 25th PBR: Unleash The Beast series. Instead, the 7-year-old stayed at home in Ardmore, Oklahoma, following a series of rodeos this summer and being a part of the D&H Cattle Company breeding program. Bruiser is the No. 1 active bull in the PBR and heads into Round 2 of the 2018 PBR World Finals with a World Champion Bull average of 46.28 points. He leads No. 2 Smooth Operator (45.63 points) by 0.65 points ahead of Thursday’s showdown. No. 3 Spotted Demon (45.06 points) is 1.22 points back. Francisco Garcia Torres is slated to take on Bruiser, while Fabiano Vieiraand Marco Eguchi take on Smooth Operator and Spotted Demon, respectively. Page said he is OK with the draw and added that it is key for Bruiser to get off to a fast start out of the gate. But does Bruiser still have that top-notch eruption? That is arguably one of the biggest unknowns heading into T-Mobile Arena on Thursday night. Bruiser last bucked in competition in late July at two rodeos. He was marked only 44.5 points during Derek Kolbaba’s 89.5-point ride in Salt Lake City at the Days of ’47 Rodeo and 45 points during Joe Frost’s 90.5-point ride at the PRCA event in Rock Springs, Wyoming. Bruiser did not look like his normal powerful self in either of those trips, and Page has taken a cautious approach with his bull during the last three months. There were two instances – Austin, Texas, in September and Greensboro, North Carolina, in October – where Page was going to haul Bruiser only to pull him out of the event. Page said the minor stiff joint issue that was hindering Bruiser earlier this fall should no longer be a factor this week. Still, he isn’t sure how Bruiser will buck in his first competition at any level in three-plus months. “He has been off for so long that my fear is he is a little rusty,” Page said. “He has bucked over 100 times (in his career). He knows what he is doing. Hopefully he is sharp enough that his muscle memory (kicks in) and he will get a good start. The PBR World Champion Bull is based on a bull’s top eight outs during the premier series regular season and two outs at the PBR World Finals. The bull with the highest average bull score across those 10 outs will be crowned the champion. PBR Director of Livestock Cody Lambert believes Bruiser will show up with a little bit less ability than normal. Bruiser has historically been dominant in Vegas too. Bruiser is 5-1 with an average bull score of 45.54 points in three trips to the PBR World Finals. He used 47- and 46-point bull scores to win the 2017 World Championship. Bruiser is 44-12 (PBR UTB) and averages 45.56 points per out. The fifth-year pro is 7-3 with an average bull score of 45.95 points, which is the second-best of his career. A third World Championship would put Bruiser in prestigious company. He would join Little Yellow Jacket and Bushwacker as the only three-time World Champion Bulls in PBR history. Bruiser would also join Little Yellow Jacket as the only two bulls to win the title in three consecutive seasons. Page agrees with Lambert about Bruiser’s legacy, but he is hopeful the bull can add another chapter to it this week at T-Mobile Arena.